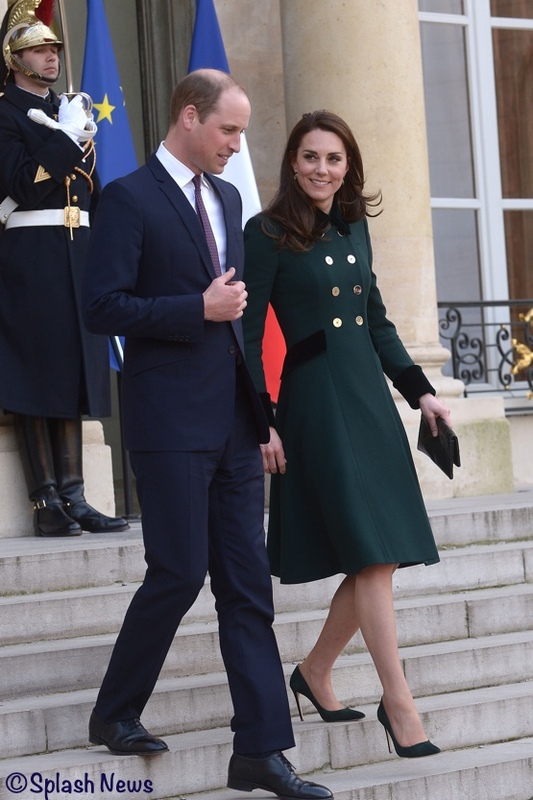 The Duchess arrived in Paris wearing the Catherine Walker coat seen earlier this morning with the Irish Guards. 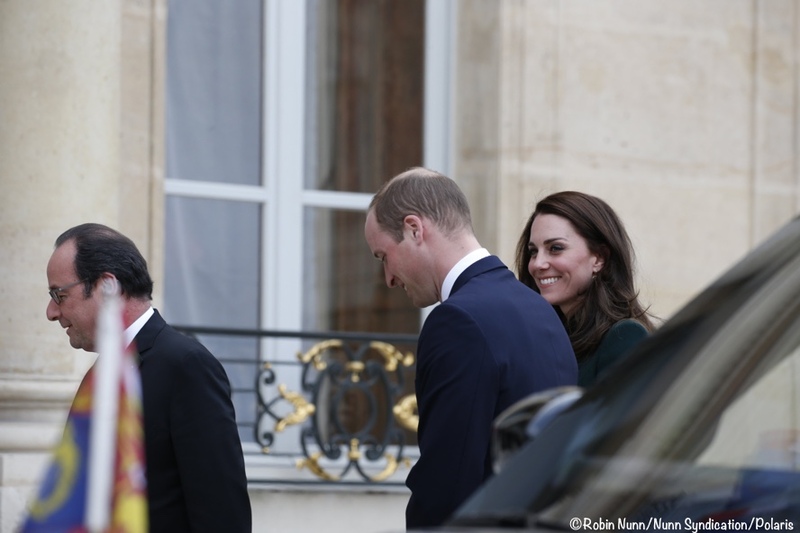 Below, the Duke and Duchess arriving at Élysée Palace. Just ahead of them you see French President François Hollande. The formal three-shot with the Duke, the President, and the Duchess. The group briefly remained on the Palace steps, allowing another opportunity to quickly shoot photos. They met President Francois Hollande at the Elysee Palace in the first of seven official engagements in the French capital. The group chatted about occasions on which they had met before, including an event in Belgium to mark the centenary of the start of the First World War and also at a ceremony in France last year to mark the Somme Centenary. Before they left the president took them outside into the gardens of the palace for a second photocall, walking them down a sun-bathed terrace in front of the waiting cameras, stopping to chat occasionally as he pointed items of interest out. The President shakes Kate’s hand as the couple departs. The duo may have been relieved the official welcome was concluded. Meeting heads of state can be stressful; it was certainly a change from this morning’s duties. 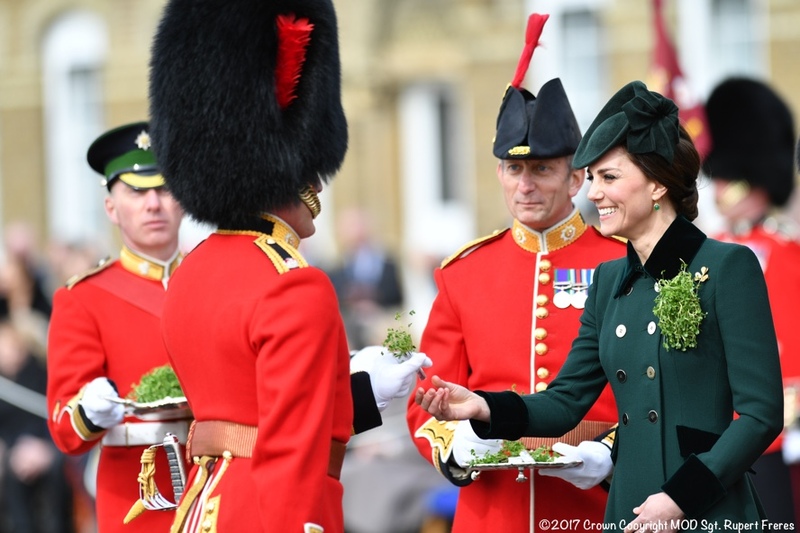 Kate surprised royal watchers by remaining in the dark green Catherine Walker coat she had worn earlier in the day to present shamrock sprigs to the Irish Guards in London when she met the French president on their arrival. Aides suggested there had been no time for her to change on the private charter jet that flew them from London. The Duchess, accompanied on the plane by her privately-funded hairdresser Amanda Tucker, had let her hair down after wearing it pinned up under a hat earlier. 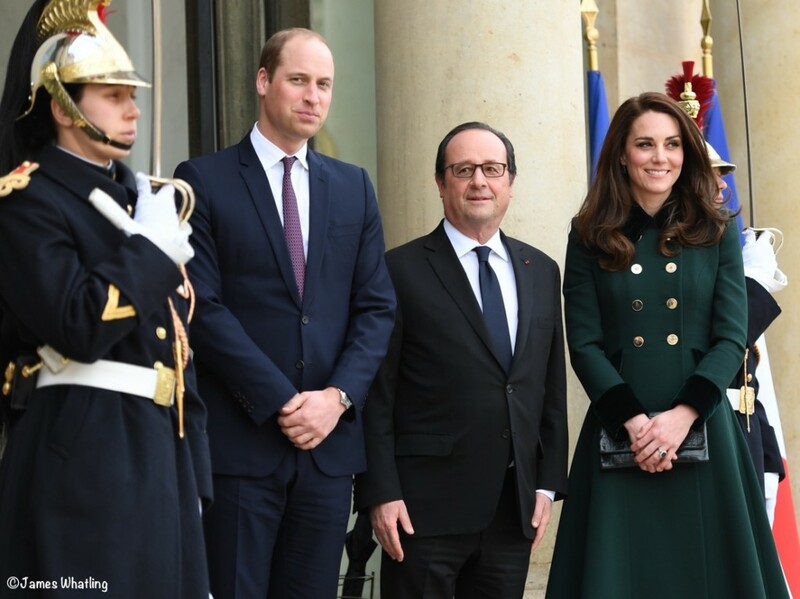 One reason Kate may have chosen to wear the coat for the arrival: Catherine Walker was French. She was born in northern France, moving to London while studying for her Ph.D. 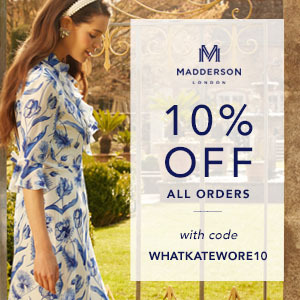 There is no need to repeat all of the details of Kate’s wardrobe, that information may be seen in this morning’s post. Briefly, the shoes are the ‘Rebecca’ style by Emmy London in a new color called ‘Greenery.’ The hat is a previously worn style by Sylvia Fletcher for Lock & Company. There is one item that wasn’t covered in the Irish Guards post: the maker of the handbag Kate carried for both of the day’s events. The handbag in the center photo belongs to a WKW friend who would like to remain anonymous. It is by Etui, and she suggested Kate’s bag may be as well. Etui is based in Poland, and Anna of My Small Obsessions immediately got in touch with the company; she lives in Poland and was able to correspond with Etui. The company confirmed Kate was carrying one of their bags; you can see how excited they were at the news in their Instagram post. We should have a better photo of Kate’s bag in the next day or so. Etui does not currently have an e-commerce site, but the bags can be purchased by directly contacting the company via its Facebook page. Several WKW friends report the company has been very helpful when contacted via its Facebook page. We will hopefully be able to update with more photos before the weekend is out. I was in John Lewis Oxford street London, and Topshop Oxford street yesterday and they still had these Etui clutches in stock in a variety of colours including this green, and 2 different sizes. I also bumped in to someone who I believe is the etui owner, or British importer, and he said they weren’t producing any more of that print for a while, but he didn’t rule it out. Also, they have 2 sizes of this clutch, and contrary to what etui PR says (large clutch), I believe it is the small clutch Kate is carrying, having looked at both myself. They are lovely bags though, really good quality for the price. I bought a range of colours in that print. You can buy it online in their shop. They are depends on model between 30-50 euro so very affordable. 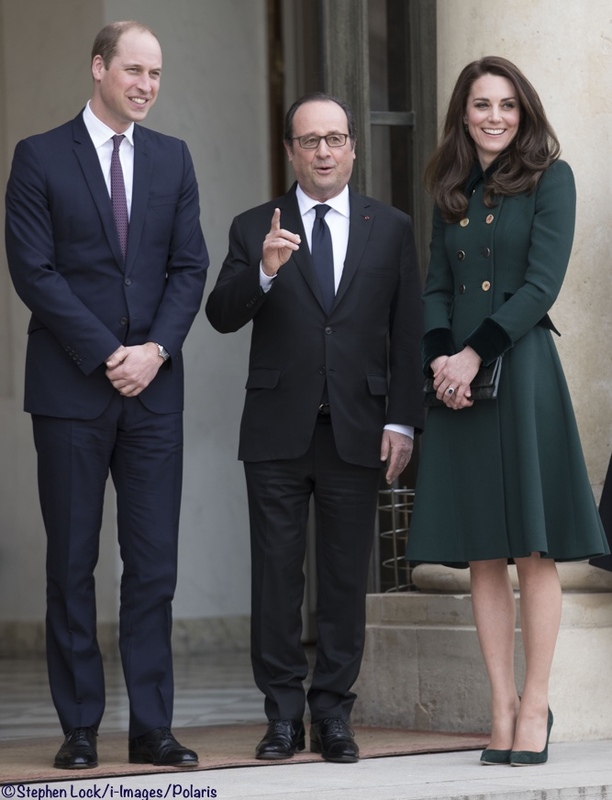 This may have been commented on in previous posts, but I am so confused about Kate’s wristwatch! It looks so casual and chunky for her outfits lately. What is going on with this accessory??? I like the watch for sure, but not with every outfit. It’s a Cartier–perhaps she wanted to make that nod to the French and a French company. She did wear it more on this trip than we usually see when she’s at home in England. Kate looks absolutely GORGEOUS in this colour! This is a winner! I love the coat! Where can we see the evening dresses worn on March 17? There is so much about the arrival and day 2, but no photos or comments on the evening wear. Each event on the trip had a separate post. I love this coat, especially if it does have a slightly lighter than normal trim so that the green shows through, it may be just light showing the base colour of the black though (all black just being a very dark shade of something else). The double-breasted heritage colour coats have always been a favourite of mine & I prefer the flare on this one (as opposed to straight). 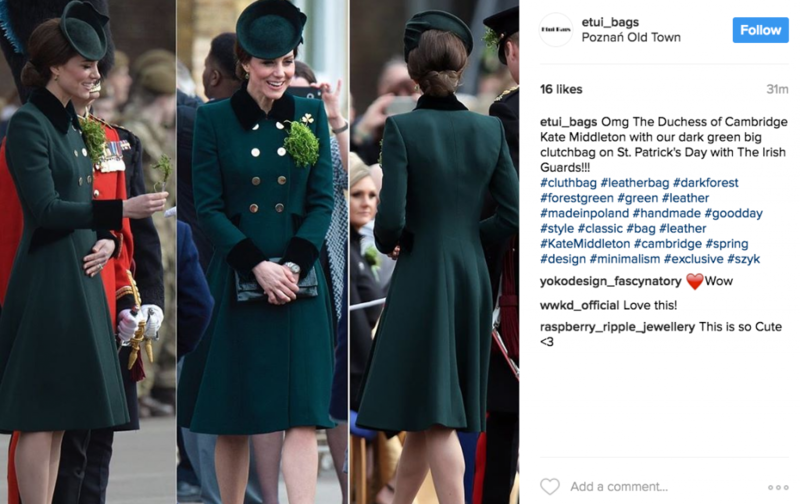 A couple of photos appear to show Kate is wearing a mini-dress/skirt under her coat, which is often the case (or navy); it is not a coat-dress, she doesn’t wear them (apart from the first one for St Paddy’s day & worn the 2nd time whilst pregnant). I think she makes the coat ‘The Outfit’ & wears something very light underneath so as not to get too hot. I don’t know why her aides would say she had no time to change her coat, this was silly; not only is she on the aircraft for more than 2 minutes but she also had her hair done, no doubt her makeup touched up & a comfort visit, but also had her hair done, probably had a snack too, plenty of time & I’m sure she removed her coat for all that, I don’t see her having a blow-wave in it somehow! I would have preferred the aides to have looked bewildered & turned the question round & asked “Why would she want to change it?” Kate is not a ‘dress-me-up-doll’ to entertain people fascinated with royalty, she was on the first of 2 important European trips after the British British vote. That said, I echo SG’s comments – I cringed when I saw her sat down with the president still wearing it. She has plenty of official-photo-worthy light dresses, don’t know why she hugs the coats as outfits. Sorry, I repeated myself about the hair, and I meant the British Brexit vote (not British British). I’m not on any noteworthy official visits/anything (I wish! ), but sometimes in my career, we go and visit other branches. I’ve been asked if I’d like to hang up my coat, but it is a bother to me to shrug out of it, look for it after the meeting, and then put it back on. Sometimes in a rush, a crooked collar might be missed, a belt needs to be fumbled with… it is so much easier not to have to worry about all that especially when you have a lot of hands to shake/files to hold. I can only imagine that especially with photographers around, Kate might not want to be in a situation of the sort. I like to think this is the reason why, at any rate, because I definitely relate. Thank you, Susan, for your typically brilliant coverage. It was an enjoyable two days. Whew, I have just gotten to the end of this very full weekend crop of posts and admin, you deserve a huge thank-you for all those hours of work you put into them! I can’t believe we got the ID on that bag — I thought that would be a UFO forever! Fantastic work and how useful is that for us to have a Polish-speaking contact who can winkle the information out of Etui. .Looks like Kate and her team have been exploring outfits for the next mini-tour to Germany and Poland already. Great fun to have something Polish in advance on this trip. A very appropriate outfit for the engagement. Her hair looks amazing, shiny, bouncy, and it was a good move to unpin it and leave the hat at home. In France, women only wear formal hats at traditional weddings or at the races, so it would have been a bit gauche to leave it on. I really like the bag, it is larger than her usual clutches and a nice change from the Bayswater. I went and had a look at the company’s website, but I couldn’t find this particular bag. Drat! I don’t think that this was all part of a careful plan — she always wears Catherine Walker for arrival/departure on official visits. The brand seems to be her safe and professional travel uniform. I loved today’s! I think it is clear that this is a coat and not a coat dress, and I think I saw somewhere she was wearing some kind of dress underneath it. So why exactly is she wearing a coat indoors to meet with the president of France??? It is bad enough that she frequently doesn’t take her coat off for her engagements. But to meet with the president of a ally nation? It is impolite, and typically a breach of etiquette, as it indicates a desire to leave quickly. If she is cold, then she needs to wear more substantial garments underneath her coats, because it is just not cool that she wears them inside all the time. The Duke and Duchess have a number of advisors on protocol and etiquette. Keeping a coatdress on is not a breach of etiquette, and I can’t imagine her ever being impolite. It’s no different from wearing a suit, in which case she wouldn’t remove her jacket. It’s not as though she’s sitting there in a ski jacket or Barbour. She is very appropriately dressed for meeting the French president. I think SG’s point was that this is a coat, not a coat dress, which I personally am not clear on. It’s made of a heavier material than one would ordinarily use in a dress but OTOH she doesn’t seem to be wearing anything under it, which would point to its being meant as a coatdress – and would obviously preclude the possibility of doffing it indoors. It is not clear from any of the photos that I have seen whether this is a coat or a coat dress. 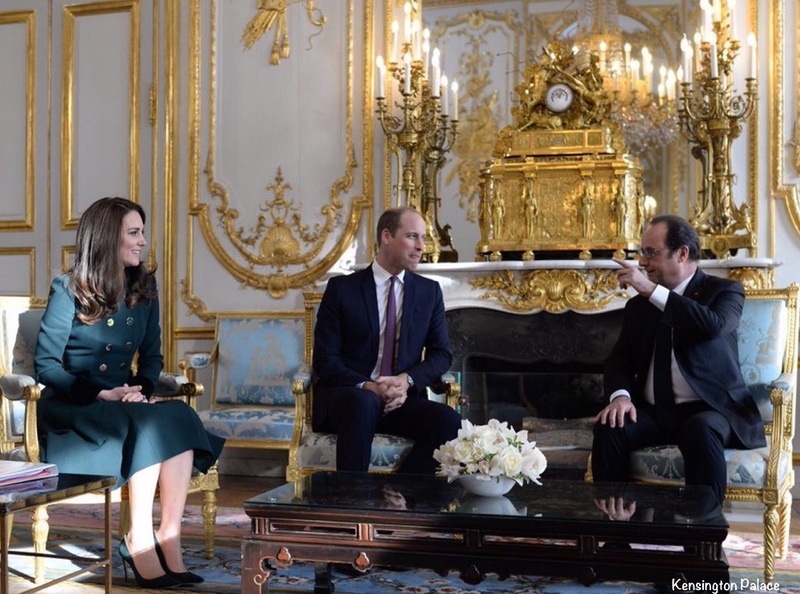 However, the fact that Kate kept it on for a 30 minute meeting with the French President, could in no way be classed as a breach of etiquette!! Remember that royal visits and events are on a tight schedule. Who needs to find that extra time for taking off coats, placing them somewhere, and putting them back on again. All for a 30 minute meeting! It’s not like she sat through a lunch with a coat on!! And we do see that when she is going to be at a place for several hours–with speeches, playing and talking with children, etc., she certainly removes her outer wear. How I do wish people would stop finding fault with every little thing or looking for imagined faults!! yeah, after looking at this photo, and the one Admin posted on “Tidbits” post I think Admin you were right the first time, there is no skirt or dress under the coat. It looks like there is some kind of lining or modesty panel and the Duchess is not wearing a separate garment underneath, IMO. This was a coat dress as she wasn’t wearing anything under it. The coat flew up a bit at the Irish guards and there was nothing other than the green coat lining. So, she was right to keep this on inside. I just love this coat! Does anyone know for sure, if the velvet trim on this coat is black or a very dark green? In the two side by side photos of Kate, one with the hair up and the hat on, the trim looks to be black. In the photo with no hat and her hair down, the trim on Kate’s coat looks green. I believe it is a very dark green that looks black in some angles/lighting. I have a dress just like that, and find the ‘colour-shifting’ gorgeous. You can see the green as well in some of the pictures in the Irish Guards post.